GPU Gems 2 , M. Pharr and R. Fernando, eds., Addison-Wesley, March 2005. Real-time terrain rendering with all data processing on the GPU. Abstract: The geometry clipmap introduced in Losasso and Hoppe 2004 is a new level-of-detail structure for rendering terrains. It caches terrain geometry in a set of nested regular grids, which are incrementally shifted as the viewer moves. 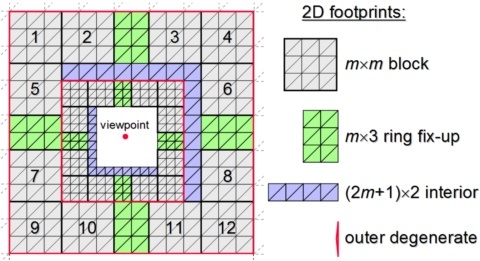 The grid structure provides a number of benefits over previous irregular-mesh techniques: simplicity of data structures, smooth visual transitions, steady rendering rate, graceful degradation, efficient compression, and runtime detail synthesis. In this chapter, we describe a GPU-based implementation of geometry clipmaps, enabled by vertex textures. By processing terrain geometry as a set of images, we can perform nearly all computations on the GPU itself, thereby reducing CPU load. The technique is easy to implement, and allows interactive flight over a 20-billion-sample grid of the United States stored in just 355 MB of memory, at around 90 frames per second. Hindsights: Unified shader cores in the latest graphics cards (NVIDIA GeForce 8800 and AMD Radeon HD 2900) provide fast texture sampling in vertex shaders, making this implementation of geometry clipmaps extremely practical. The PTC image compressor mentioned in the paper was the precursor to the JPEG XR standard, which is supported in the WIC interface of Windows. See also the original paper and the recent book 3D Engine Design for Virtual Globes [Cozzi and Ring 2011].